So what is this fear? Ladder Anxiety is simply the fear that players feel before, during and after a ranked 1v1 ladder game in Starcraft 2. Wait, what? Its a video game, you're meant to have fun! Stop playing games that make you feel uneasy you silly gamers! But that's not the case, people both enjoy and fear to play 1v1 in Starcraft 2 and other games when losses are displayed to other players. But why? Its 1v1, If you lost you have no one to blame but yourself. Points, every ladder game rewards or deducts points which people use to measure how much better they are than other players. Other people can view your results, with the Real ID and friends lists your friends will know how poorly you are doing. In RTS (Real Time Strategy) games people believe that your performance is directly related to your intelligence. Even if you defeat your opponent, the system looks for someone harder than the last. Eventually you will lose to someone better. You don't know your opponent, he could do anything, you cant prepare for everything. Everyday thousands of people suffer from ladder anxiety, but you can make a difference.. The factors I have mentioned combine and cause a very real fear and suspense for players waiting or playing in a ladder game. If you're not a Starcraft 2 player you might not understand how this feels, but imagine you care about something, people know you for it and consider you the best in your group at it (perhaps in art, cards, bowling, what ever your hobby or passions are) and then in front of your peers you will be measured against someone else who could be better than you, and even if you're better than them soon you will have to be measured again vs someone even better than the last. A good example of the feeling might be similar to public speaking, one of the biggest fears for most people (even more so than death for some). But its all in your head right? Well yes and no. It is in your head, in the form of chemicals. All of the factors combine to create a "fight or flight response" in the body that causes Epinephrine (Adrenaline) to be released in your body, directs blood flow away from the extremities and towards major muscle groups. If a normal situation where this happens to you in real life it allows you to better fight or run to save yourself from the current danger. But in a game were you are sitting at a desk, using the mouse and keyboard it can make your hands feel cold and clammy, your heart rate and breathing raise. People don't understand why and it can have a negative effect on your playing ability, and if you lose the game you'll remember and be even more apprehensive of the next game. You WILL lose eventually because of how laddering works(actively trying to match you up with even opponents so you stay around 50% win/lose ratio), don't worry it happens to everyone just learn from your mistakes (watch those replays!) and its not a problem. Don't play flustered, if you have lost a series in a row you're probably mad, you wont think straight, take a break and come back when you have cleared your head. Take breaks, but don't avoid. Its a get back on the horse thing, the more often you make excuses the less you will do it, building the fear. Play often, you'll get used to you and maybe even crave the feeling. Stick to the plan! You have to adapt for what your opponent does, but panicking and switching to something crazy wont help. Ultimately everyone has their own methods for dealing with fear, don't feel foolish if its something that comforts you. GSL player Choya talks to himself on live TV in Korea to calm himself down, so you like to hug your teddy when playing but its too stupid? Big deal you're alone just do it and feel better for it. Now that you have considered all this, there is really only one thing to do isn't there? Go on do it, I dare you! I double dog dare you! I am a masters league actually :) but yeah I feel you. I have to play like 3 or 4 custom practice games before I'm confident enough to ladder. 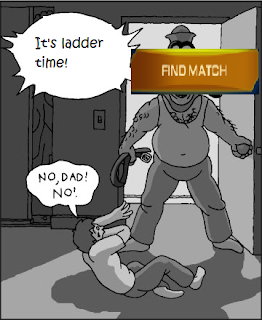 I also ladder for a long time so I'm all warmed up for each match. Oh my Dobbs - I COMPLETELY FORGOT that I payed for this game! People get way too into this game, takes away from the fun of it being a game.. I sort of know what you're talking about. I'm tempted to get Starcraft 2 and try it out. I was always more of a C&C guy though. Dude go outside and enjoy the sunshine for a change, hahha. I started off with C&C games, kinda lost interest after Red Alert 2 when Westwood was bought.